Last week I had the opportunity to do a case study on Navigator Holdings Ltd., and how WL Ross & Co. recapitalized the privately held shipping company prior to its successful IPO. 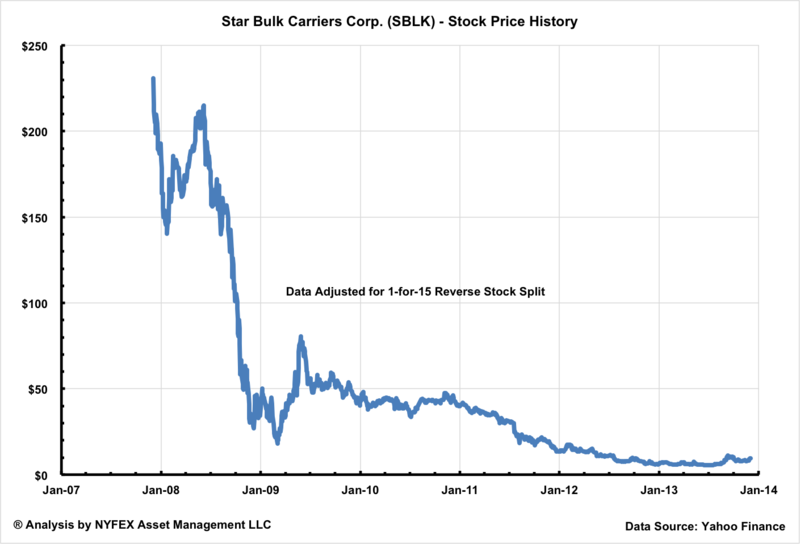 This week I will look at a different strategy: recapitalizing Star Bulk Carriers Corp., a publicly traded shipping company. Star Bulk is based in Athens, Greece and specializes in dry-cargo bulk carriers, as an owner and third-party manager. Its shares are traded on NASDAQ under the symbol SBLK. Star Bulk Carriers traces its history in its predecessor Star Maritime Acquisition Corp. Star Maritime began life in May 2005 as a blank check company in search of suitable vessel acquisitions in the shipping industry. In December 2005, Star Maritime raised $200 million through an IPO and commenced trading on the American Stock Exchange under the symbol SEA. Almost two years later on December 3, 2007, its successor company Star Bulk Carriers Corp. began trading on NASDAQ, after having agreed to acquire a fleet of eight bulk carriers from Hong Kong-based TMT Co. Ltd.
On the first day of trading the shares closed at $15.34 per share, or $230.10 on a reverse-split adjusted basis, valuing the company’s equity in excess of $600 million. But following its debut, Star Bulk Carriers saw its stock price & market capitalization drifting lower & lower, in correlation with declining shipping asset values. By the time management effected a 1-for-15 reverse stock split on October 15, 2012, Star Bulk Carriers had been a penny stock valued at approximately $45 million. Even though management had successfully restructured its loan agreements to avoid a covenant breach and preserve cash, Star Bulk closed the books for year 2012 with $224 million in debt and in desperate need for fresh equity. What happened next is a case study on how to radically recapitalize a publicly traded company, while preserving the right of existing shareholders to get a piece of the action. Instead of doing a private placement with a select group of strategic investors, Star Bulk embarked on a rights issue that gave existing shareholders the option to invest alongside strategic investors on the same terms and conditions. In July 2013, Star Bulk raised approximately $80 million in gross proceeds through a rights issue at $5.35 per share, backstopped by Monarch Alternative Capital L.P. and Oaktree Capital Management L.P., among other investors. The two private equity groups got their feet wet by investing $20 million each. 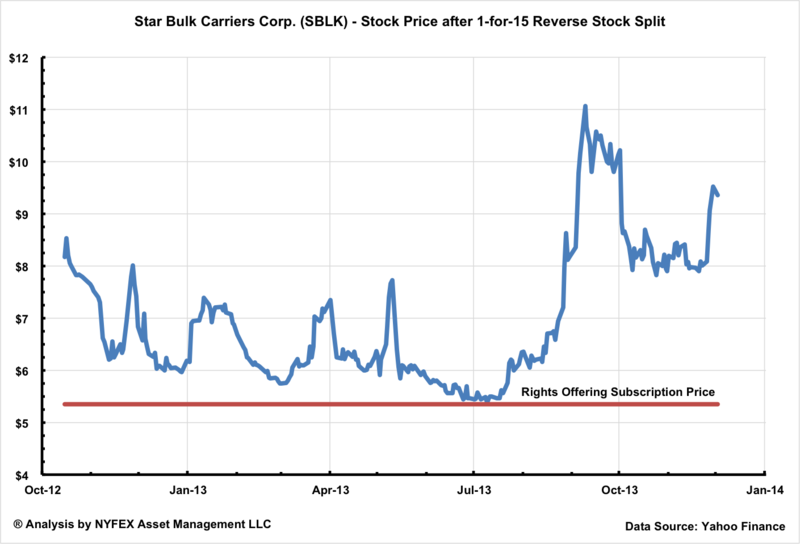 In October 2013, Star Bulk raised an additional $71 million in gross proceeds, this time through a fully subscribed public offering at $8.80 per share. Oaktree & Monarch doubled down by investing an additional $20 million each. Following the equity fundraisers, the two private equity groups emerged as the largest shareholders of Star Bulk, each with board representation rights. By the time the dust had settled, Monarch and Oaktree together were in control of 42.2% of the company. Why was Star Bulk able to entice two of the savviest investors to commit a total of $80 million in equity capital? Because it offered value at a discounted price, combined with a growth story. Starting with equity valuation, Star Bulk had conservatively a net asset value of $48.7 million, or $9.01 per share as of December 31, 2012, without taking into consideration the market premium of its time charters. Corroborating this analysis, the company’s CEO during an investor presentation in NYC in March 2013 estimated the premium of the time charters at $33 million, and pegged the company’s net asset value at $89.6 million or $16.43 per share. 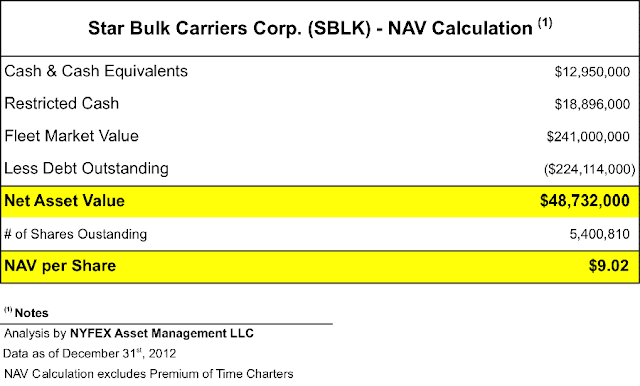 Unlike shares of other shipping companies in dire financial straits that had a negative NAV, Star Bulk’s shares still had value left in them. In addition, management proceeded with a backstopped rights offering at a subscription price of $5.35 per share. The price level represented a generous discount to its NAV and was also well below its stock trading range. To this date the stock has never closed below the subscription price. Not only were the rights attractively priced, they were also equitable to the existing shareholders. Existing shareholders were given the option to participate on the same terms and conditions as the underwriting private equity groups. In fact, approximately 44% of rights given to existing shareholders were exercised. Yet value for money was just one half of the secret ingredient. The other half was the company’s strategic plan to grow and modernize the fleet. Armed with approximately $150 million in fresh equity, Star Bulk embarked on a $365 million new-building spree, ordering nine fuel-efficient vessels, with deliveries starting in the second half of 2015. In addition, it acquired two modern Ultramax vessels for $58.1 million scheduled for delivery in December 2013 and January 2014 respectively. The new-building program and recent acquisitions will radically transform the company. Star Bulk owned a fleet of 13 vessels, with a total DWT capacity of 1,290,602 MT, and an average age of 10.7 years, as of September 30, 2013. In three years time, and assuming no further asset acquisitions or divestitures, the company is projected to own a fleet of 24 vessels, with a total DWT capacity of 2,640,526 MT, and an average age of just 8.1 years. This is the kind of growth scenario that Wall Street loves to hear. The shares of Star Bulk closed yesterday at $9.36 per share. Its market capitalization now sits comfortably at over $270 million. Star Bulk Carriers Corp. has planted the seeds to survive the current tough environment and prosper in the upcoming cyclical recovery in the shipping industry. Investors that had done their homework were able to jump on its bandwagon. I wish them and the management of Star Bulk Carriers Corp. fair winds and following seas. Correction: In the original article, I inadvertently omitted Oaktree's $20 million investment in the company's October 2013 equity offering. The article has been updated to reflect Oaktree's additional investment. The Coming IPO of Scorpio Bulkers Inc.